Behavior like this is beyond contempt. 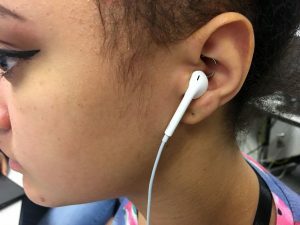 Teachers and admin feel like the headphones and earbuds policy is helping students, but students say they need music to work better. The school cracked down on headphones and cell phones last semester, banning them entirely from all classrooms during class time. “We hope for students to pay attention in class and talk to teachers,” said Jason Harris, assistant principal on the SHS campus. But only one out of twelve students we talked to like the new policy. “I think it’s stupid because it helps me focus more listening to music rather than without,” said Aiden Diehl, a junior from Anchorage. Some of the teachers were ambivalent about what’s happening in their classroom. Another teacher echoed that idea. “I haven’t seen a huge change in learning. Some students might’ve even slowed down,” said Dawn Pomrening, the academic support teacher at the SHS campus. A third teacher we talked to said there are a lot less students getting distracted, and they are definitely more focused on work, although he can see lots students are frustrated by it. “I think it’s a good thing, because it teaches students to focus on work and not worry about what’s happening on their phones,” said Paul Apfelbeck, the media and info teacher at the SHS campus. Almost all the students we talked to say that listening to music helps them get work done, because it blocks out all the sounds around them and helps them concentrate on finishing their work. Two out of twelve students actually said that the policy had actually helped them get their work done and do better in school.